Send Your Comments or just say Hi !!! I am also active in the Open Bible Church....I could not not have gotten this far in life without GOD. He is always providing help for me to reach my goals....In my church there is also three more hams and we are all involve in ham radio projects..........Where I work I really do need GOD's strength , I am a Prison Officer and work there since 1994, because of my job it teachs me about people and how to deal with them. 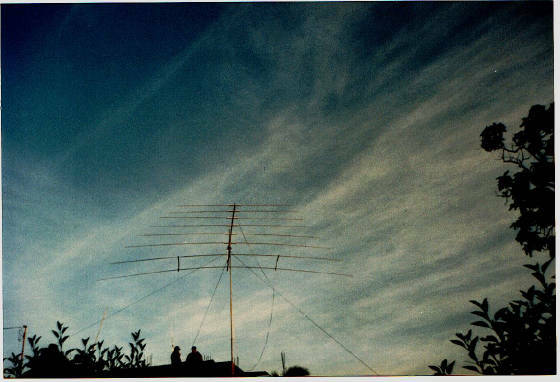 I like antennas..It is great to reasearch the info ..find parts to work and put up a BIG antenna...When it works GREAT, its a good feeling. 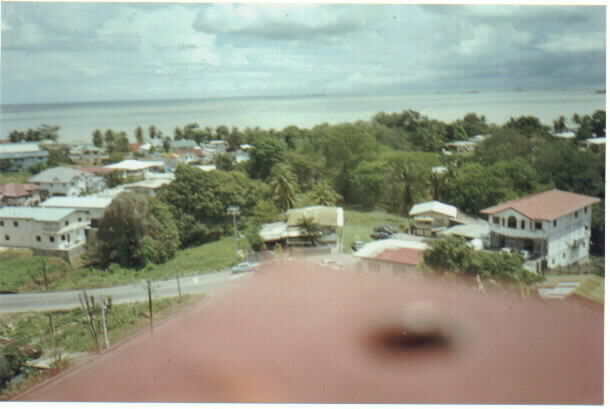 This is what it looks like from the top of my 55ft Tower..The first photo shows looking out to the northwest..on a clear day you can actually see Venezuela from my home.The second photo is looking to the east..There is my 6m yagi (when it was 6 elements) and my 8 element 2meter Quagi, also seen are the houses in my area.. This is a home version of the Cushcraft ASL 2010. 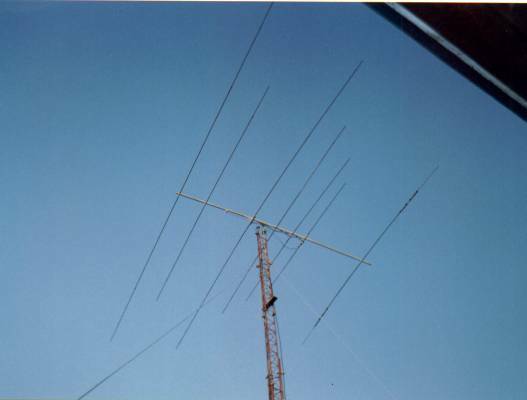 I wanted an antenna that would give me 20-10m coverage with one feedline without using a tuner. I came across the specs of the 2010 in a CQ magazine...read some info on log periodic..did some more reasearch then built my own. I got good results and built this one for a good friend of mines 9Z4CS-Jerome .My second antennas always comes out better. 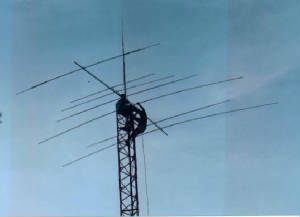 Here is a homebuilt X7 built for 9Z4CT-Nigel.....This antenna was built by using material from a 3ele triband Cushcraft and a 3ele 12 & 17m Cushcraft plus a little more material.........This was a great project and the owner is really happy with his signal now......A description of how I built this is on another page. 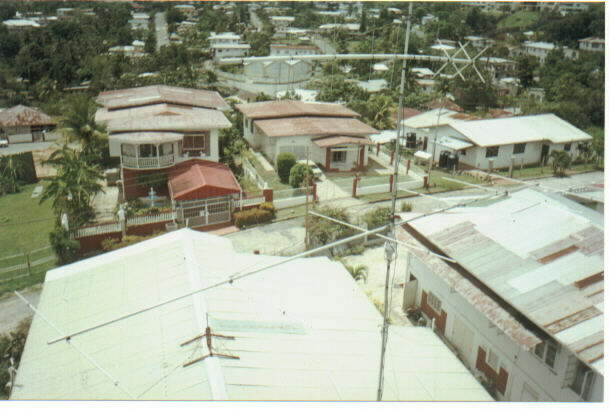 Here is a 3 element 17m Yagi (On Top) and 3 element 20m Yagi (Bottom) I built for 9Y4TR Derek (now VE3CZF).He and His XYL lived in Trinidad for some months and I built these. He is back up in Canada and took them up with him..He reports great signals and busting pileups (barefooted).. 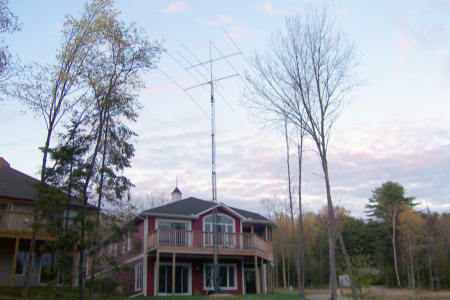 Here are some links that goes to some great antenna websites, that I have found while looking for and researching different antennas. HF Yagis by VE3GK..Lots of great info. Some more info on the X7 Log periodic.